Here you can find journal titles that are related to tropical medicine. Some of these journals will be available in print (you may need an ILL account to obtain articles) and some will be available online. If you are trying to access an article online, make sure you have set up your Resource Access Account. You can also search by title for journals in our catalog. Journal titles below listed alphabetically. Links direct you to information about dates available and location (at the library and/or online). Also consider finding titles by searching for "tropical medicine" in the TMCL journals OneSearch. 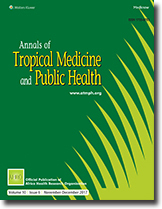 formerly known as "Annals of Tropical Paediatrics: International Child Health"
Journal of Venomous Animals and Toxins including Tropical Diseases (Open Access Journal) by Universidade Estadual Paulista, Centro de Estudos de Venenos e Animais Peçonhentos.